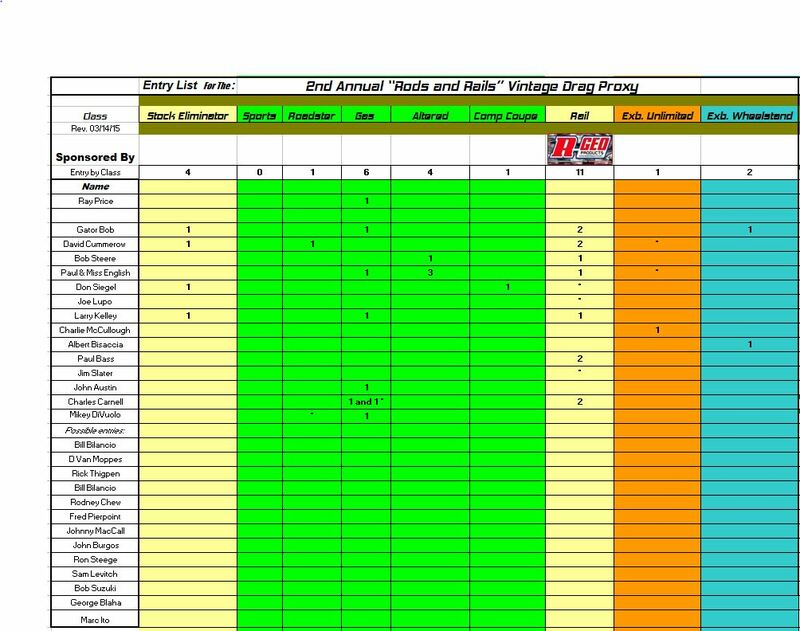 List shows those who have committed to enter. 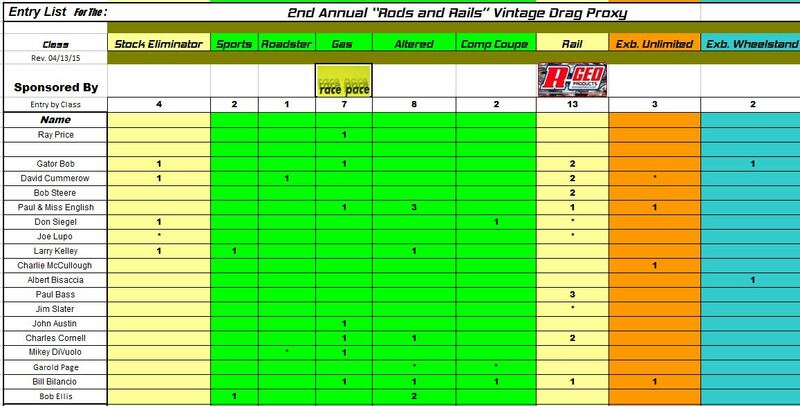 Those shown as possible (hopeful) entries are known to have competed in a drag proxy before or have cars and previously shown interest. Note: This is open to any racer that can present a car that is eligible. Sign-up for this event closes April 16th 2015. I hope there isn't a boycott of any kind. BAD Bill should be participating Bob Will see if I can catch up with him . 31 cars so far, not counting the seven * place holders. You can take me off the "possible" list now. Put me down for 2 "Rails" and definately 1 "Gas", I guess, it's a '49 Merc with a Dynamic chassis and an open frame Pittman in it. If I get the other car done in time, it will also be a "Gas" car. Don't forget the 2 rails. Does anyone know how to tell the different voltage arms in the Ram/Pittman "Padlock" motors? I know they made at least 2 different voltage arms. None of mine have the voltage marked on them like my KTM Motors. The only way I can think of is creating a list of average pole resistances from known factory voltage arms. Help me fill in the blanks and remove some asterisks . Contacted Bill and sounds like he should have some cars taking part Bob Don't know how many or what classes but watch out as I'm sure there will be some top notch Padlock racers! Garold has way cool stuff and you're the ace reporter and a proven top eliminator driver. Please ask him to jump on here and confirm, I don't want Bill to miss the chance for awards this year. He could PM me or post from his account or Paul send me contact info. We might hit 50 total cars. "When in doubt, don't chicken out"
Now just gotta kick the design & construction departments rear ends to get all the cars built & finished in time ! I'll need my altered entry changed to a rail, for a total of 2 rails. Welcome to Bob Ellis ! Guys, double check that I have you down for the right classes and please confirm any asterisks in your row. Double checked and correct classes for us Bob gonna be FUN !